Have you ever had a craving for food from a specific restaurant, but didn’t really feel like calling and definitely didn’t feel like getting yourself together and going all the way down there to order and pick up your dinner? Non-traditional students experience this feeling of, “It’s just not worth the time” every day. Even though they want to advance their education, the idea of going to the registrar’s office to make their payment, or getting on the phone to talk to someone about what’s available and when, is exhausting. And for most students, who simply do not have the time during business hours to schlep down to the university, it’s impossible. So, let’s go back to the restaurant example. On a night when you don’t feel like cooking, how do you order food without picking up a phone? For most people, they log onto a website like UberEats or Grubhub, access their account and then order—and pay for—their entire meal online. It takes less than five minutes. Why is this relevant to you? Well, by following best practices established by online retail giants, you can make enrolling in and paying for a course as easy as ordering a pizza. In fact, with the right system, it’s possible to make the entire student experience no more cumbersome than ordering a ride on Uber or buying a book on Amazon. At the heart of the best practices established by these market leaders is customer self-service. Your college or university should have an online shopping cart and self-service portal that makes it as easy as possible for students to manage their own registrations, payments and other aspects of their enrollment. The system should also support students with features like abandoned shopping cart notifications, where students who fill their cart but don’t complete the transaction receive an email encouraging them to go back and register. When push comes to shove, today’s students are juggling more priorities and have less time available than ever before. They want to give their full effort to their courses, and have neither the time nor patience to be distracted by administrative challenges. Your job is to make it as easy as possible for students to quickly manage as much of their own enrollment as possible. Focusing on the key conversion point where website visitors turned into enrolled students is a great way to start a lifelong engagement with learners. 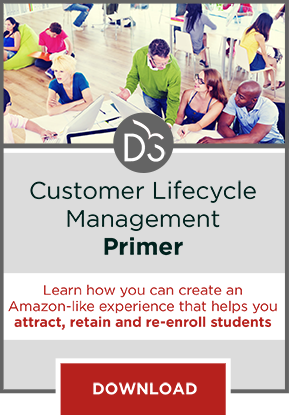 To learn how you can leverage a Customer Lifecycle Management system to maximize enrollments and reduce burdens on students, download this primer.